Lorraine Music Academy supports LAMP Trust‘s cause of building Responsible Citizenship through Nation Building Projects utilising Music, Art & Culture based on Fundamental Duties of every Citizen of India, as detailed in Article 51A of the Constitution of India. 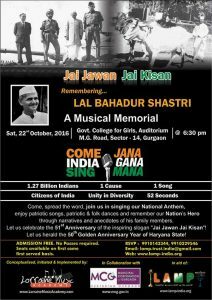 The project is a Musical Memorial to observe the Anniversary of the famous slogan “Jai Jawan Jai Kisan”. This slogan was coined by our Nation’s Hero, Bharat Ratna Lal Bahadur Shastri. He gave this slogan to our nation in order to inspire the Soldiers and the Farmers of our country. When Lal Bahadur Shastri took over as prime minister of India after Jawaharlal Nehru’s death, India was attacked by Pakistan. Meanwhile India was facing several years of drought and scarcity of food grain. Thus this slogan enthused the Soldiers of our nation to defend India. Simultaneously it cheered the Farmers of our nation to do their very best to increase the production of food grain. As a result, we reduced our dependence on import and thereby India became a self reliant nation. Bharat Ratna Lal Bahadur Shastri gave this slogan in October 1965 at a public meeting at Ramlila Maidan, Delhi. In fact, under his inspiring leadership, India faced and repulsed the Pakistani invasion of 1965. By all means the 1965 war was fought and won for our self-respect and our national prestige. Indeed, the battle against the shortage of food grains was fought for our nation’s self reliance. This slogan became very popular and still resounds across the length and breadth of the country. Surely this slogan is still relevant to the India of our next generation. This slogan translates in English as “Hail the Soldier, Hail the Farmer”. This is a feature length film based. It is based on in-depth research of available records. 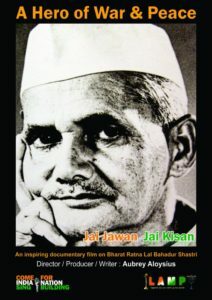 Also, it is built on detailed interviews with the family members of Bharat Ratna Lal Bahadur Shastri. This film also draws insights from key leaders who have played a role in nation building across various sectors. This film is the story of a fatherless boy who was born on the banks of the river Ganga. It is an untold story of a boy who faced severe trials thrown at him by poverty. Moreover, it is a true story of sheer dint of dedication, sincerity and high character. As a result, he rose steadily to occupy the highest position in the land. Yes, he became the Prime Minister of the world’s largest democracy! Moreover, it is said that “No legacy is as rich as HONESTY”. Yes, he was born poor. Did he die poor? No, he did not leave behind money or land for his family. Yet he left a rich inheritance and legacy of honesty! Not just for his close family members, but for his larger family – the nation of India, and the world. Without doubt a model citizen who became an inspiring leader! Indeed, an Unsung Hero! This project is a series of Musical Concerts. It gives a clarion call to 1.27 Billion Indians to stand together for one cause – the Unity of India. This is a call to sing one song – our National Anthem. 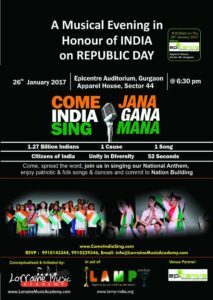 To sing it in the correct code as laid out in the Constitution of India, which is around 52 seconds. This project is based on the nurturing of the unique potential of the children and youth set in India today. In fact, we believe firmly that tomorrow belongs to the young people of today. As India gains influence on the global stage, we aim to give great young minds and talent a voice in the shaping of our nation. Indeed, few countries so aptly represent the inspiring and vital cultural ethos of “Unity in Diversity” as India. Moreover, music transcends cultural borders and acts as the greatest symbol for social harmony. Surely, coming together in singing our National Anthem strengthens us to believe in the potential we have to influence our nation. Coming together and creating art and music at any time strengthens us to believe in the potential we have to influence the world.